In this series we will discuss and document the most popular screens from our shared screens list. 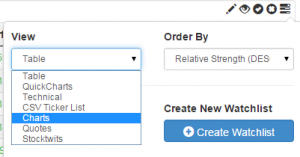 This list is an excellent starting point for new users and allows you to discover the power of chartmill step by step. You can find the ‘shared screens’ in the top level menu. The page shows a table of predefined screens that were shared by our users at some point in time. By default, they are ordered by the number of likes received over time. When you click the eye-icon, you will get a basic introduction on the screen. The information displayed is what was entered by the person sharing the screen. The goal will be to extend the basic information already provided and to give some additional advice to use these screens effectively. A handy view for iterating over the output is the ‘charts view’. This view just shows you the charts of the results, which allows quick visual inspection of each candidate. So if the view is not the ‘charts view’ by default, you can change it by configuring the settings of the results section. Pick ‘charts’ for the ‘view’ parameter. The exchanges, for instance ‘US only’. Whether or not you want ETF’s in your selection. So we have our list nicely displayed as we like it, now what? So now we just buy the stocks that are displayed? Absolutely not! The output of a screen gives you a list of potential setups. The screener just did 90% of the work for you, but now it is up to you to find those stocks in the output that are really worth investigating further. A good way to approach this is to create a watchlist and add those stocks that you find interesting to this list. 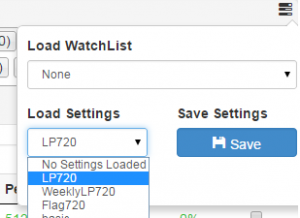 You can find some more information on creating watchlists here. In the end the market will decide whether your pick will be successful or not. The general market conditions should always be taken into account. If the sentiment is negative overall, there is a pretty good chance that also your pick will not be able to make it, even though it looks technically solid. No matter how good your pick looks and no matter how good the market conditions are, your pick can still fail. Knowing when you will exit the trade when it goes against you up front and being able to limit your loss when it does so, is what will make you profitable in the long run. We provide a position sizing tool that helps you determining your position size. Find some info here and here. In the next set of articles, we will go into each of the popular screens and point out why they find good setups and what you should look for when going over the output of the screen.